You hear your door come crashing down—those birthday monsters are in town! And they're going to wreak havoc in the most extraordinarily rude ways. What fun! 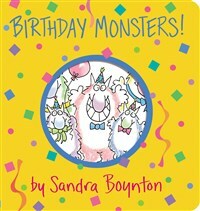 From Boynton on Board, the 8-million-copy-bestselling series of extra-big, extra-fat, and extra-fun board books, here is BIRTHDAY MONSTERS. Featuring Sandra Boynton's lively rhyming text and inimitable illustrations, this story about a madcap crew of lovable party crashers will appeal to kids and adults alike. Main selection of the Children's Book-of-the-Month Club. Sandra Boynton is a popular American cartoonist, writer, and songwriter. Since 1974, Boynton has written and illustrated over sixty children’s books and seven general audience books, including five New York Times bestsellers. More than 70 million of her books have been sold. She has also written and produced six albums of award-winning children’s music. Three of her albums have been certified Gold, and Philadelphia Chickens, nominated for a Grammy, has gone Platinum. She lives with her family on a farm in New England.